Five weeks after introducing its first plant-based sliders, White Castle is making perception headway with both millennials and people who consider healthy eating important, but seems to be having trouble sustaining Purchase Consideration with these two consumer groups, according to YouGov BrandIndex. Since the veggie sliders debuted on April 12 in half of its 380 locations, White Castle’s perception with these two demographics took positive jumps, especially with the people who have an interest in healthy eating. Their reaction was almost instantaneous on that day, sending White Castle to its second highest levels of 2018 with that group. The real question is whether these two important groups will try the new item and return for more. In these first five weeks, millennials registered more promising Purchase Consideration levels, YouGov BrandIndex’s metric of potential sales revenue. 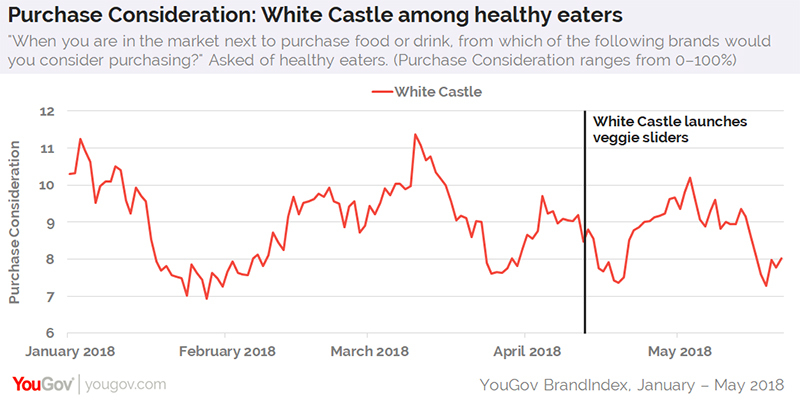 Adults who value healthy eating gave White Castle a three-week incremental boost in Purchase Consideration right after the slider introduction, moving up from 9% of healthy eaters considering the chain for their next purchase of food or drink to 10%, and then back down again. Still, White Castle reached higher Purchase Consideration levels with this group as recently as March 2018 (11%) and December 2017 (12%). Millennials show more traction, but have also touched higher Purchase Consideration levels in the recent past. On April 13, the day after the product launch, 5% of millennials said they would consider making their next food or drink purchase at White Castle. Nearly two weeks later, that level reached 12% before dropping to 7% on May 10, and then bouncing back up to its present 11%. YouGov BrandIndex measured perception using its Buzz score, which asks respondents: "If you've heard anything about the brand in the past two weeks — through news, advertising, or word of mouth — was it positive or negative?" A score can range from -100 to 100 with a zero score equaling a neutral position.